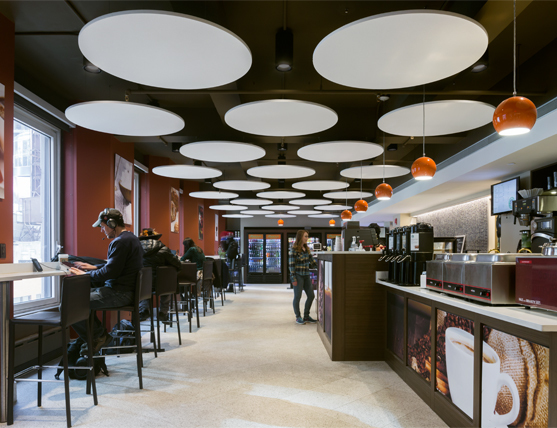 Ownership of the newly repositioned 1560 Broadway wanted a café to serve the building’s tenants, including hundreds who attend casting calls at Actors’ Equity offices. 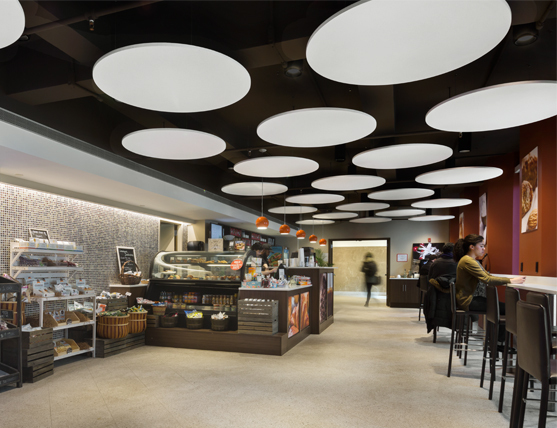 Café entrances are located along the building’s new 4th-floor sky lobby, a convenient location above the hub-bub of Times Square. Working with the building owner and lessee to design a striking, comfortable interior that complements the building’s new and reorganized public areas. The lessee provided its own decorative case goods and displays. The ceiling height of the café was maximized. An acoustic cloud ceiling, new single-pane, tilt-and-turn windows, and a lively palette of materials contribute to a breezy feeling in the space.